On the HC-05, I have changed the baud rate used in the communication mode to 38400. This means I do not need to change anything when switching between AT mode and Communication mode. Make the 2 circuits and power on. The LEDs on both the HC-05 and the HC-06 should be blinking quickly. Put the HC-05 in to AT mode (hold the button switch closed while powering on). If you are not sure how to do this see Arduino with HC-05 (ZS-040) Bluetooth module – AT MODE. When in AT mode the LED on the HC-05 should blink on/off every second. Cycle the power to the HC-05. The LED on the HC-05 will blink twice a second as it searches and once it has connected with the HC-06 the LED will quickly blink twice every 2 seconds or so. The LED on the HC-06 should be constant on. Now, what every you enter in one of the serial monitors will be sent by Bluetooth to the other Arduino and then displayed in the opposite serial monitor. This entry was posted in Arduino, Bluetooth and tagged HC-05, HC-06 by Martyn. Bookmark the permalink. I am really enjoying your flurry of BT blogs. I am setting up a bluetooth connection and have received a lot of help through your efforts. Thank You. 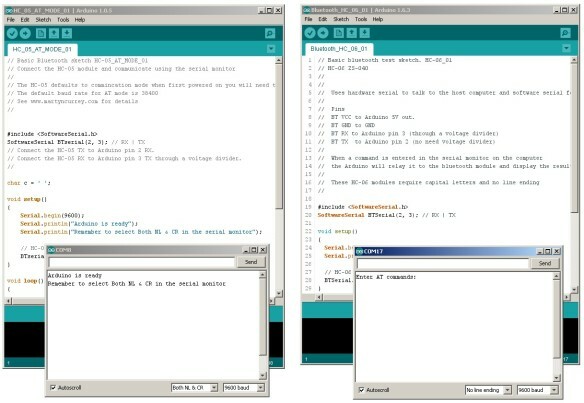 Did you ever notice you can run several instances of the same version of the Arduino IDE simply by starting the application a second or third plus times? This has worked since before 1.0. I remember??? It works are the current versions too. I’ve been doing this without thinking about it for quite a few years. Good to hear the blog is useful and thanks for your comment. I started using 2 separate IDEs a while ago due to issues I had having 2 serial monitors open at the same. This became a habit and ever since I never thought to try running multiple instances of the newer IDEs. Thanks for the tip. Thanks for this post. It is great. I am new to this bluetooth thing and I have some questions. I was able to connect the HC 05 (master, cmode=1) to android (slave) using AT+PAIR command. Before they were paired, the android pops up a screen to ask for the password (1234). I typed it and they were paired. Looked your post, I don’t see anything about providing password when connecting hc-05 to hc-06. Can you provide me more info ? CMODE=1 allows the HC-05 to pair with any device. I can’t remember if the passwords have to be the same though (I suspect they need to be) and I am traveling at the moment so can’t confirm. Try a test. Set the the HC-05 and the HC-06 to have different passwords and see if they still connect. Report back what you find. I really enjoyed working on your setup. Its an awesome tutorial for starters like me. Thanks for the post. I was just wondering can I connect 2 master HC05s or 2 slave hc05s only? I mean can I configure both as either master or slave and still initiate communication between both of them? Bluetooth connections always require a Master/Slave combination with the Master device initiating the connection. The HC-05 can be used as a Master or a Slave device and so 2 HC-05s can be used (one must be set as a Slave though). The HC-06 is a Slave only device and can only accept connection requests, it cannot make them and so will always need a Master device to connect with. The EN pin, when HIGH, disables the module. It is not used for entering AT mode. You need to connect pin 34 to +3.3V not the EN pin. can we connect more than two slave at the time with master . ? AT+CMODE=1 means the module can connect with any BT device. You can only make one connection at a time. If you want to connect to several BT modules you need connect one at a time. hi, I’ve managed to get two hc05’s paired, one on a Leonardo as a master and one on an Uno set as slave. they seem paired ok.
what I was wanting to do is send variable values that have been calculated on the Leonardo across to the slave (Uno) to control a motor. have been looking for some sketches to get an idea of the send / receive commands between the two but no luck. I’m new to arduino and have only been learning for a few weeks, any idea where I can learn specifically on this? every search I do comes up with how to pair modules and not how to use them once paired…. It would be better to sort out the communication side using a wired connection first. Once you have this working add the BT connection. Think about how you want to format the data,not just for sending but also how to make it easier for receiving. For example I generally use ascii formatted data as this makes the code on the receiving end a little easier. It is not the fastest way to send numeric data though. This thread is very useful and Robin’s recvWithEndMarker() function forms the starting point for all my projects that use serial communication. Hello. Your blog has been really helpful in my project. I am working on connecting two micro-controllers using bluetooth. For that I want to light a LED connected to one arduino by giving command to the other one. Is that possible? this is very possible but I do not have an example to show at the moment. Thanks for the help. I have successfully been able to light an LED by connecting a button to one arduino and the LED to another. But Can you suggest some real life application of such connection between two arduinos? You could use two microcontrollers to create an app in which one microcontroller collects certain data and sends it to your phone. The other microcontroller could collect another variable of information and send it to your phone. Thus making it possible to create an app in which you could connect the microcontrollers and send all information to you at once, or each device relays at its own pace. By the way could you commet/post your sample code to connect two microcontrollers? Thanks! Actually , i want to pair the two HC-05 bluetooth Modules but according to your site , USB to TTL convertor has been used . How can we pair the 2 bluetooth modules withou using USB to TTL Convertor? Can pairing of bluetooth be done with help of AT commands ? To use AT mode you need to communicate with the BT modules by serial. This means using a USB to serial converter. This can either a dedicated device or an Arduino with a basic sketch. You do not need to have both BT modules connected by serial at the same time. Connect device 1, set as a slave, set up the password and baud rate etc, then connect device 2 and set up as a Master. It’s hard to suggest an application and most of my projects are things I do simply to learn how to do them. I do have a a turtle lamp that is controlled by an Arduino. This normally works on a timer but has a Bluetooth controller for manual over-ride. I also have a Bluetooth LCD. This is simply an Arduino connected to a 4×20 LCD and a Bluetooth module. I then display things on the LCD from remote Arduinos. No real application and I usually use it for debugging. This post is really useful. I am trying to use Bluetooth to transmit a potentiometer value between two arduino nanos. I followed this guide to setting up the modules however when I type “Hello”, for example, it gives “zú”. On the HC-06 my serial settings are No Line Ending and 9600 baud. The HC-05 Both NL CR and 38400. This is an example of turning a LED on and off but the principle is the same. Instead of sending the on/off command send the potentiometer value. 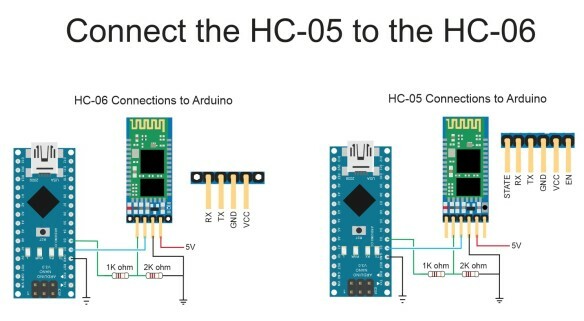 J’essaye de connecter 2 arduino uno entre eux par le biais de 2 modules bluetooth HC05 et HC06. En essayant avec le tuto ci dessus ça ne fonctionne toujours pas. Thanks for this, been a great help. Do you know why the receiving unit is showing symbols instead of the text that has been inputed by the transmitting unit? Hi,if the default baud rate of hc-06 is 9600 as the previous article you post,then I cant send right data to each other BT,I also check MY default baud rate ,is also 9600. So I change the BTserial.being() to 9600 ,so it works. I still want to make a sure,do you use 38400 or you change the baud rate already? We are trying to connect to 2 arduinos with their respectives bluetooths. We already pair the bluetooths but we can’t send information from one arduino to the other one. We have an arduino uno with one bluetooth and an arduino mini with another bluetooth, and we want to send information from one arduino to the other one so it writes the values into an lcd screen. We´ve been trying to do it for weeks but we can’t find a solution and i was wondering if you could help us. Bc we tried with your code but it doesn’t work and off all the possible examples we looked for yours is the better. what Bluetooth modules do you have? Are you able to use AT commands and get replies? I have been working with an HC-05 now for two days and have not been able to get to the bottom of my problem. First, I can talk to the HC-05. The firmware version is 2.01-20100601. I see that you have dealt with that before maybe you can help. I can get the HC-05 to talk both directions if it is in the Slave mode. When I put it in the master mode, it will only receive but will not transmit. In looking at all of the documentation I can find, I see that some of the documentation lists a “AT+MODE” function. The documentation states that if the Parm= 0 it equates to receive only, if the Parm= 1 it will to transmit only and if Parm= 2 the devise will communicate in both directions . Sounds simple, put the HC-05 in Mode 2 and go. My problem!! The HC -05 will not respond to the AT+MODE command. It comes up with an ERROR =0. I have found there are several of the listed commands that the HC-05 won’t answer to one of them being the AT+HELP command. What are you thoughts on the situation?? Different boards have very different firmwares. I have zs-040 modules with the 2.0-20100601 firmware. Not sure how this is different to yours but the examples for the zs-040 boards should help. Almost every time two-way commination does not work it is due to a problem with the circuit. Check the connections, check the resistors on the voltage divider (very common to have problems here). Check the voltage coming out of the voltage divider. Have you had two-way communication working in slave mode?. If not you should start here. If I am trying to use two HC-05s, one as the slave and one as the master, should I just use the above HC-05_AT_MODE_01 code for both arduinos? Thanks in advance for your help! Please give it a try and see what happens. I have been trying to pair two HM10. I am using Arduino Uno both sides. I tried bit there has been no success. I have a Master (Arduino + Bluetooth module HC-05) and several Slaves (Arduino + Bluetooth module HC-05). I know the MAC address of all Bluetooth devices. How do I programmatically assign the MAC address of the device to which I want to connect. AT-command AT-BIND is not suitable, because I want to choose which device I want to connect to at the moment. Thanks for the example. I’ll try to figure out how to do it all in Arduino itself, without using the PC. You cannot connect to more than 1 slave at a time so you have to connect to each slave in turn. Pair all the devices (you can pair up to 7 at any one time) then use the Arduino to connect, disconnect to each slave in turn. Hello Arduino Community, I am connecting two bluetooth modules, and i can see that they are pairing because of the LED lights. When I try sending any data, it returns an “unknown character” sign(the question in the black box). Garbage/random characters is almost always due to a wrong baud rate. Since you are using 9600 in the sketches, double check that the BT modules are set for 9600. Hi, this is great; however, I have done everything, but when I send a message from -05 to -06, the serial monitor of the -06 reads ?????. Same amount of ? as letters sent. Also, the -06 wont send a message to the -05 and the LED on the -06 blinks around every 4 seconds. BAUD rate was wrong, but I still cannot send message to -05 from -06. I have followed this tutorial and have successfully connected them. I want to be able to press a button on one arduino and in turn turning off a doorstrike on the other. How would i do that? as i really have no clue how to code using the arduino. I wouls also like to implement a timer to allow the person pressing the buttono time to enter the door. I’m assuming I am using the first example. What code would Iimplement to make a button turn OFF the led instead of on? as there is no button on the example and the LED is turned on instead off. I know this might be really tedious for you and I appreciate the time you are taking out to help. Have a look at the LED example in the HM-10 post. This is a simply LED on LED of example. Although this is for the HM-10 the process for switching things is the same regardless of the type of Bluetooth module. You will need to adapt the sketch slightly to meet your needs. Is the the correct piece of code i need to be looking at and thwart would i need to change? Thank you for your patience. within this example the button is connec to slot 2 if that is already occupied can i put into any other slot? is it possible for HC-05 to have multiple slaves? yes but only one slave can be connected at one time. This means, to create a network you need to connect, get data, disconnect to each node in turn. As said in my previous post above I am using a 12v door strike. Would the use of a relay for the doorstrike affect the code? If so, what do I need to add. No, the code is the same, all you should need to do it turn a pin on/off. It may effect how you connect it to the Arduino though. Hey, Whenever i send something between the two module it just gives me question marks, does that mean it does not understand what I’m sending?? Now with a guide on turning a blinking LED on and off. Hi,can i control using one master to multiple slave, i use several button in master ,when click one button ,then corresponding slave active and give response,can it possible,please help me. This is kind of possible using BT 2 but it is not ideal. With BT 2; the master can only connect to one slave at a time. This means to use more than one slave you need to disconnect the current connection, then connect to the new slave. what could be the issue? thanks! I was wondering if you’ll be able to help? Do the modules have the same passcode? I followed all the steps and the connection is established automatically when i power up both arduinos. The baud rates on both devices is same. However when I try to send messages they dont get replicated in the other serial port. I get funny characters instead. How do I solve this? If using HC-05s, remember that they use 2 different baud rates. One for AT Command mode and a different one for data mode. im having a few difficult problems. the BT moduel does not respond to my AT command at all. i have followed the instructions to the best of my knowledge. i have a video where you can see exactly what im doing. it does not let med show it here how ever. if i could get an email adress i could send it to i would be greatfull. is it mandatorily necessary to cycle the master´s power to pair him the first time with a new slave? Though I resetted both devices (AT+ORGL), deleted the List of authorized devices (AT+RMAAD), set one as master (ROLE=1) and both to CMODE=1, they do not pair, unless I cut master from the power. Do you mean connect rather than pair? 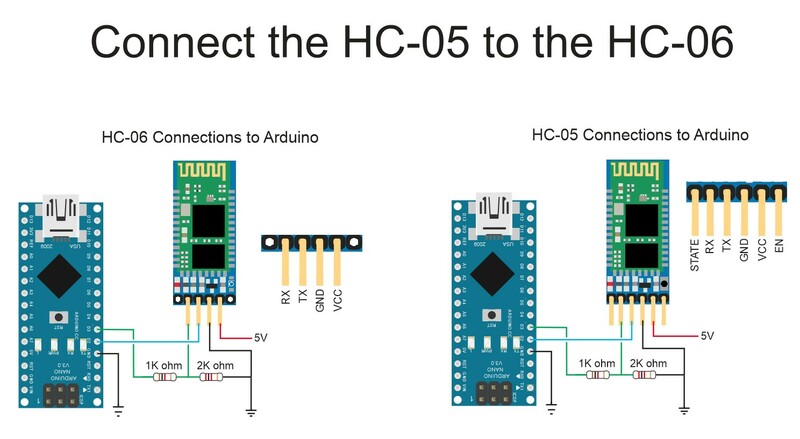 When a HC-05 starts, while in CMODE=1 mode, it will search for and connect to another HC-05/06 module. I can’t remember but it may do the same when you reset using the reset command.